​Your students are going to love these fierce sisters who fought to save their country. Author Harness tells her readers that the Trung sisters are remembered today in plays, poems and songs. From Homer’s Odyssey through Longfellow’s The Midnight Ride of Paul Revere literature often holds memories of important figures in history. Use this Minute to talk about plays, poems and songs that reflect both famous and infamous historical figures. In the western hemisphere, we learn very little about the ancient history of the eastern hemisphere. Break the trend and have your students look at the major events in Asian history, starting with Vietnam. Start with your databases or encyclopedias, and then see what you can find online (check out Asian Nation for a succinct origin story and dynasty coverage and Thoughtco’s Asian History for a manageable overview). Once students have the skeleton of the history in place, start making comparisons to what students know about their own countries ancient historical beginnings. Get out the world map and have students become familiar with the location of Vietnam. How far is it from where they are located? How would you travel there? Ask for cardinal directions. Look at the latitude and longitude and see if students can predict the climate based on the location. What kinds of physical features do they find? How might these features affect the population’s movement over time? Author Harness tells of the Chinese colonization of Vietnam. Look at the pattern of colonization over the history of this country. What makes some countries susceptible to being colonized? Are there differences between the “aggressor” and the “invaded?” What are these differences? How important is the geography to whether a country is colonized? Is colonization ever a good thing? Important historical figures are often memorialized in monuments. There was a monument memorializing the Trung sisters erected in Saigon (though pulled down after a political tussle in the 1960’s) and other temples and statues memorializing these sisters. Have your students explore memorials and monuments in or near your hometown. Whose statue is down at the county courthouse? In the state capitol? In the nation’s capital? What medium is used in memorials? Have your students choose someone to “memorialize” and design a memorial. 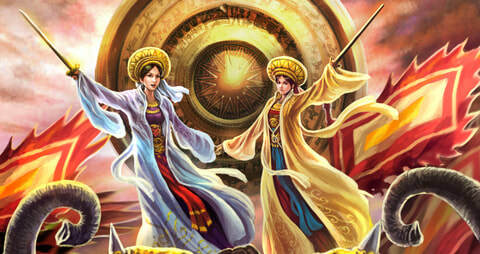 This Minute references songs written to memorialize the Trung sisters accomplishments. Explore the songs that are written during historically significant periods to reflect what is happening. Search up patriotic songs that accompanied major wars and periods of unrest in our history - bet your students will recognize more than they expect! The list of martial arts styles is lengthy and comes from extremely diverse origins. The point at which they converge is the health benefits of learning and practicing them, including increased flexibility, coordination, strength, mental focus and more. Introduce your students to the basics of martial arts, including their origins and benefits.